Right-Wing Media Call Obama And Members Of His Administration "Anti-Semitic"
Obama Refers To 1967 Borders With "Mutually Agreed Swaps" In Calling For A "Viable Palestine" And "Secure Israel"
Right-Wing Media Respond To Obama Speech: He "Sided With Terrorists," Condoned "Potential Genocide"
GRETA VAN SUSTEREN (host): Now let me ask a collateral issue that is of less importance than the security of any nation or of our allies or anything but the collateral issue, and that's the political impact here in the United States. And, you know, we have an enormous population here in this country, especially in Florida where you are -- who are -- who spend an awful lot of time thinking about Israel. What does this do to him politically? BUSH: Any final status agreement must be reached between the two parties, and changes to the 1949 Armistice Lines must be mutually agreed to. A viable two-state solution must ensure contiguity on the West Bank, and a state of scattered territories will not work. There must also be meaningful linkages between the West Bank and Gaza. This is the position of the United States today; it will be the position of the United States at the time of final status negotiations. MKs on the Right expressed outrage on Thursday night at US President Barack Obama's call for the creation of a Palestinian state based on the 1967 lines with mutually agreed swaps, in an exchange of territory for security. "Barack Hussein Obama adopted Yasser Arafat's staged plan for Israel's destruction, and he is trying to force it on our prime minister," Likud MK Danny Danon said. "All that was new in the speech was that he called for Israel to return to 1967 borders without solving the crisis. Netanyahu has only one option: Tell Obama to forget about it." Environment Minister Gilad Erdan, also from the Likud, who as a minister close to Netanyahu must be more diplomatic, said on Channel 2 that according to Obama's approach, the Palestinians would receive what they were demanding on borders before negotiations begin. "Once they have everything from the start, they have no reason to make any concessions," Erdan said. But opposition leader Tzipi Livni said Obama's plan was clearly in Israel's interests, while the diplomatic stalemate that she believes was brought on by Netanyahu is not. In the face of the world's condemnation, [Moammar] Qaddafi chose to escalate his attacks, launching a military campaign against the Libyan people. Innocent people were targeted for killing. Hospitals and ambulances were attacked. Journalists were arrested, sexually assaulted, and killed. Supplies of food and fuel were choked off. Water for hundreds of thousands of people in Misurata was shut off. Cities and towns were shelled, mosques were destroyed, and apartment buildings reduced to rubble. Military jets and helicopter gunships were unleashed upon people who had no means to defend themselves against assaults from the air. OBAMA: I want everybody to be very clear: The United States is going to be unwavering in its support of Israel's security and we are going to push back against these kinds of terrorist activities. And so the message should go out to Hamas and everybody else who is taking credit for these heinous crimes that this is not going to stop us from not only ensuring a secure Israel but also securing a longer-lasting peace in which people throughout the region can take a different course. I also want to express the deepest condolences of the American people to the families of those who were gunned down. And I want to thank Prime Minister Netanyahu, during a very difficult time for his country, still being so committed to the cause of peace that he is here with us today. NETANYAHU: Well, thank you, Mr. President, for expressing what I think is the sentiment of decent people everywhere, in the face of this savagery and brutality. Four innocent people were gunned down and seven new orphans were added, by people who have no respect for human life and trample human rights into the dust and butcher everything that they oppose. I think that the President's statement is an expression of our desire to fight against this terror. And the talks that we had, which were, indeed, open, productive, serious in the quest for peace, also centered around the need to have security arrangements that are able to roll back this kind of terror and other threats to Israel's security. That is a fundamental element, an important foundation, of the peace that we seek and work for. The Arrow III will allow Israel "to deal with the threat of ballistic missiles with long range" and will give it "the ability to shoot down weapons of mass destruction outside the atmosphere," the ministry said in a statement. Israel, which describes its Arrow system as a defense against Iran, says the upgraded version will cap off its multi-tier air defenses. The Arrow is jointly produced by state-owned Israel Aerospace Industries and the American firm Boeing Co. and has absorbed close to $1 billion in direct U.S. funds since its 1988 inception. The Obama administration Friday cast its first-ever veto in the U.N. Security Council, blocking a Palestinian-backed draft resolution that denounced Israel's settlement policy as an illegal obstacle to peace efforts in the Middle East. But Friday, the administration stood far apart from even its closest allies. Britain, France and Germany issued a joint statement arguing that the resolution would have advanced the peace process. Fox Nation: Obama "Slaps Israel Again." 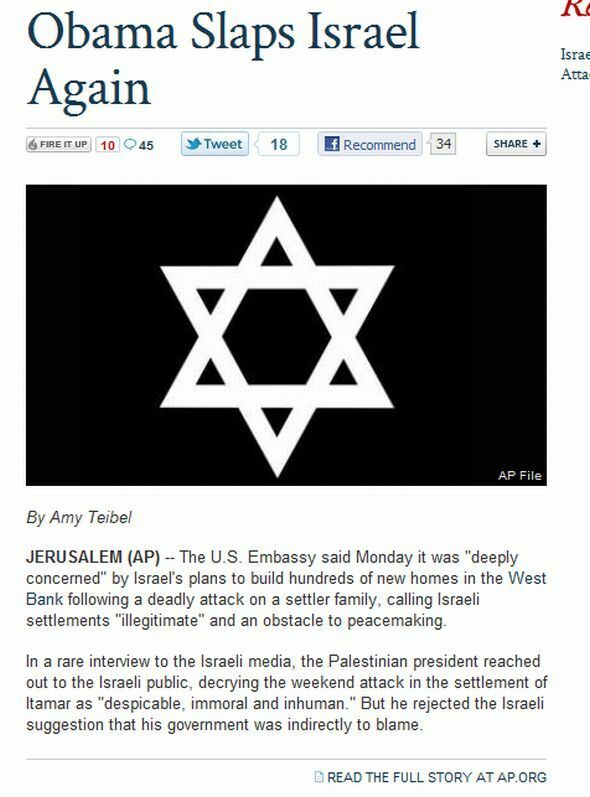 Fox Nation reprinted the beginning of an Associated Press article and used the headline, "Obama Slaps Israel Again," referring to the Obama administration's continued rebuke of Israeli settlements. Emboldened by increased popularity brought about by the killing of Osama bin Laden, Barack Hussein Obama, our first "Muslim" president, has joined with Palestinians to now knock off Israel. In a speech delivered not only to intimidate but also again embarrass Israeli Prime Minister Benjamin Netanyahu just prior to his state visit to Washington, D.C., the "mullah in chief" demanded that Israel give back all the land it acquired in the 1967 war to the Palestinians, thus compromising the Jewish state's national security. This would mean ceding all of the West Bank, including but not limited to East Jerusalem, to the Palestinians, allowing Israel to be split in two in the event of a quick successful assault by Arabs to cut bifurcate the nation. It would also mean that Christian and Jewish holy sites, from the places where Jesus was crucified and resurrected to the sacred wailing wall, would fall into the control of Muslims hostile to our Judeo-Christian roots and culture. 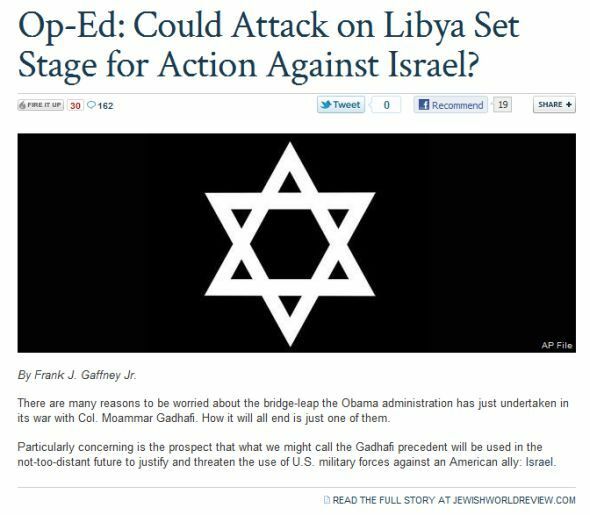 This rank "chutzpah" by Obama is not isolated. Since the beginning of his presidency two and a half years ago, he has steadfastly unmasked his disdain for Jews and Christians, first by giving a pandering "Cairo" speech apologizing to the Arab world for American "atrocities," then bowing down to the king of Saudi Arabia, canceling the White House National Day of Prayer celebration and instead feasting the Arab holiday of Ramadan, endorsing the Ground Zero mosque, and last but hardly least using the death of Osama bin Laden to effectively argue that al-Qaida's terror threat is over and that now we can have "healing" with the Muslim world -- despite its having done nothing to bring the master terrorist to justice. It would appear that Obama identifies more with his father's Muslim faith than his own feigned and politically convenient alleged Christianity. We need to mobilize Hollywood to tell the story of Israel and its importance for the nation. We need to preserve our our way of life. We need to protect our religious freedoms, which are under attack by our "Muslim" president and his fellow anti-Semites and anti-Christian haters.